- This first tutorial is a quick start guide to DM-D. It is shows how to perform initial settings for the the program, and the basic use of the Composer module, generating a first piece. - The completion of this tutorial is about 45 minutes, and allows a basic familiarity with DM-D.
B - Now, you must load a new project. To do this go through the menu: Project --> New. A dialog box appears requesting you to confirm. Click yes, and the DM-D screen will display the message New Project Loaded. C - Clicking on the menu option "WFolder" a File Explorer window will open showing the contents of the Working Folder. You must now open the worksheet Composer, which is the file "incom.htm" (may not appear "htm"). By clicking on the file with the right mouse button, it will appear the option "Edit with BlockNote.Net" which you will select. BlockNote should open. If this does not happen, you would have to open the program through the Windows Start menu, and then open the file "incom.htm" from BlockNote. Step 2: Write your first Composer "program"
The name of the generator, which is the output value and contains the pitch of the note (in the output table this value must be between 0 and 127, which are the MIDI values for pitch). The name of the generator by adding the letter "i", that defines the trigger time of the note (a new note begins when its value is not 0). 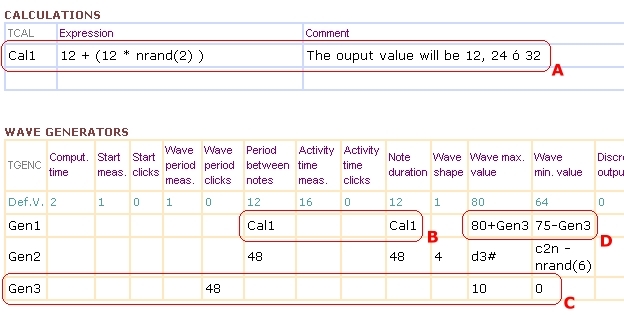 The name of the generator by adding the letter "u", which defines the note duration (in clicks). - For Instrument, write the MIDI channel (1 to 16) in which the notes are generated. For now, type 1. VERY IMPORTANT: Finally, as always, when you make any changes, you must save the file in BlockNote File --> Save. - As you can see, it is a kind of wavy scale of 15 measures length. It is not the brightest musical work, but in the following steps we will study how to make it more interesting. - Period between notes = 48 The separation of the notes is 48 clicks, ie, exactly one quarter. - Note duration = 48 The same, notes are one quarter long. - Wave shape = 4 The waveform is a sawtooth, ie continuous decline, unlike the 1st voice, which is a Sine (undulation). - Wave max. value = d3# The maximum value of the wave is Re#, in 3rd octave. - Wave min. value = c2n - nrand(6) The minimum value of the wave is Do natural, in 2nd octave, less a random value from 0 to 6 semitones. - Now the second staff appears. The first notes in each measure are always the same, Eb and Bb, but the others are changing. This is due to the random value that you have assigned to the minimum value of the wave. - First, add the boxed values in A. With these values, we are using a new table: the Calculations, which lets you assign a calculated value to a variable, named in this case as Cal1. This value is assigned to Gen1 in cells boxed by B, which control the duration of its notes. With all this what we get is that Gen1 notes change ramdomly between a sixteenth, a dotted eighth or a quaver. - Secondly, we use a powerful functionality of Composer: a generator which is used only to modify another generator. That will do Gen3, defined in Box C. Its output values are between 10 and 0, and has a period of 1 measure plus 1 quaver. - Gen3 values will affect Gen1 through D boxed expression. What they are going to do is alter its maximum and minimum wave levels, getting to be "mobile" over time. 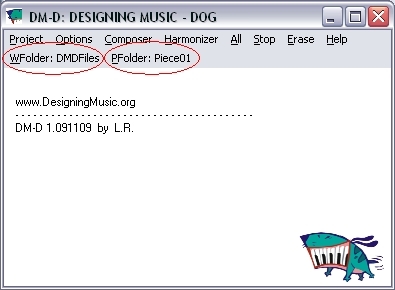 Now, we are ready to order DM-D to compose, but first remember to save the file in Blocknote! - The resulting piece should be something like this (not equal because of random values). As shown, now the melody durations vary randomly between sixteenth, eighth and dotted eighth. The high and low level of the meloly change, too. Again, it is interesting to try to modify any of the parameters, and check how they affect the music produced by DM-D.
- Here ends Tutorial 1. We strongly recommend going to Tutorial 2. It is really easy and you will acquire good knowledge about most features and potential of DM-D.